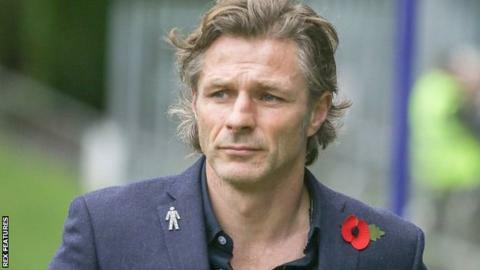 Wycombe Wanderers manager Gareth Ainsworth says he is not worried by a run of five home games without victory. The Chairboys twice came from behind to earn a 2-2 draw against 10-man Notts County at Adams Park on Tuesday. "We'll keep working, we're not getting beat which is good, there's plenty that can't stop losing at home," he said. "We're not one of them, we're always in the game, we've got chances right up to the end. It will come, I'm not concerned at all." Ainsworth added to BBC Three Counties Radio: "I think it's a trend in football, somebody said to me the other day that stats for away wins around the country is up. People counter attack better away from home - it's something we'll have to look at." Following Tuesday's result, their third consecutive home draw, last season's losing play-off finalists are 10th in League Two with a game in hand over many of the teams above them. Three of the Chairboys' next four matches are at Adams Park. "Where we are is a good position at the moment. I'm well pleased with the first half, we've got a big Christmas period now," he said. "We're still in touch with these play-offs, which people think we should automatically be in for some reason, but we keep driving on. It's another point towards the total which is great."